We're feeling pretty happy today, thinking about the last year. Our lives have been pretty different to before, and we've had an amazing time watching her grow (not that it wasn't difficult and tiring at times!) It's hard for us to imagine what she'll be like in another year. 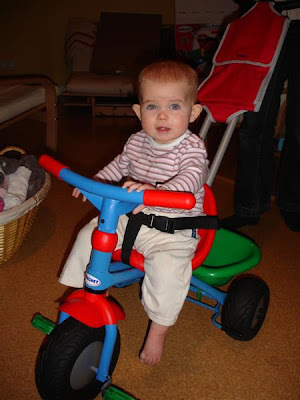 We've bought her a push-along trike for her birthday, and she'll be having a party with some of her baby friends on Friday. To give Anne and me a chance to reminisce, here's a four-minute video (with sound) of ThingOne's first year (assuming YouTube isn't down, as it was when I first tried to publish this). Thanks go out to our friends and family for being supportive and putting up with our exhaustion in the last year.